A flash of feathers and Andrew ducks his head. We’re too busy scanning the roads for snakes and craning our necks over the horizon for whales to notice a solitary magpie. It appears in slow motion, spreading its wings in a fan of black and white, its shining beak locked on Andrew’s helmet. It breaks the silence of the dead road. I know it’s schadenfreude, but I’m glad it wasn’t me. He swoops again. Fortunately he’s easy to spot, black against the clouds. We’re beginning a descent and about to pick up speed. He changes target – karma does exist. I tuck in, get low. Hopefully I’ll outrun him. After just a few hours – barely enough time for breakfast to settle – I’m relieved to see the road stretch down to the ocean. The water’s glistening and that bird is now but a mild distraction. 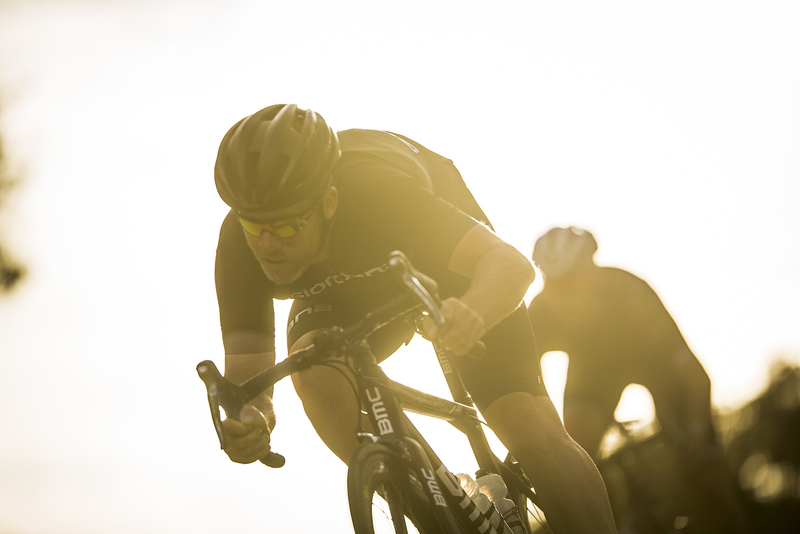 There’s nothing like cresting a rise to be greeted with a gentle downhill roll to reaffirm your decision to push on when your legs are telling you to turn back. Even in an unfamiliar region, some things remain the same. The magpie reminds me of one of my regular rides back in Sydney. The asphalt is the same colour, I’m riding the same bike, and even my feathered friend appears to be a clone of its eastern cousin. But we’re on the other side of the country, 3,000km away, in a state that comprises almost one third of our continent. This is one of the oldest and most biodiverse regions on earth, and yet so often it goes unnoticed by the majority of us over on the east coast – perhaps because the distance is so daunting. A transcontinental crossing is no small trip, especially when you have to add on a day’s drive through the cape to the Great South, where Albany awaits. But here we are – and at this moment, there’s no place we’d rather be. Wedged between the granite outcrops of Mount Melville to the north-west and Mount Clarence to the north-east, and nestled on the shores of Princess Royal Harbour and King George Sound, Albany lies protected from the forces of the Southern Ocean. 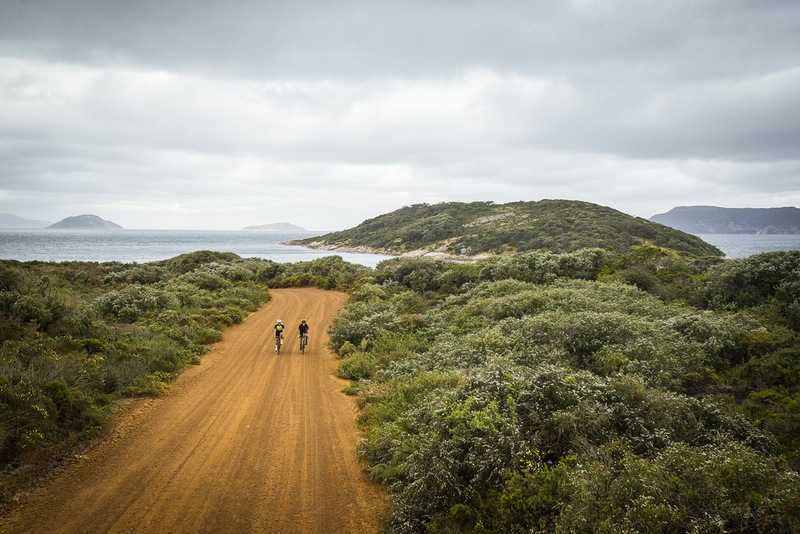 The natural harbour running south of the city is the perfect area to explore by bike. The map looks promising, with roads and tracks running the length of the peninsula. It’s 5am at Middleton Beach, the long stretch connecting Point King to Emu Point north of the city. The white sand glows in the morning light. Although it’s November, there’s a chill in the air, and it’s wetter and windier than I like it, but we didn’t come all this way to stay in bed. 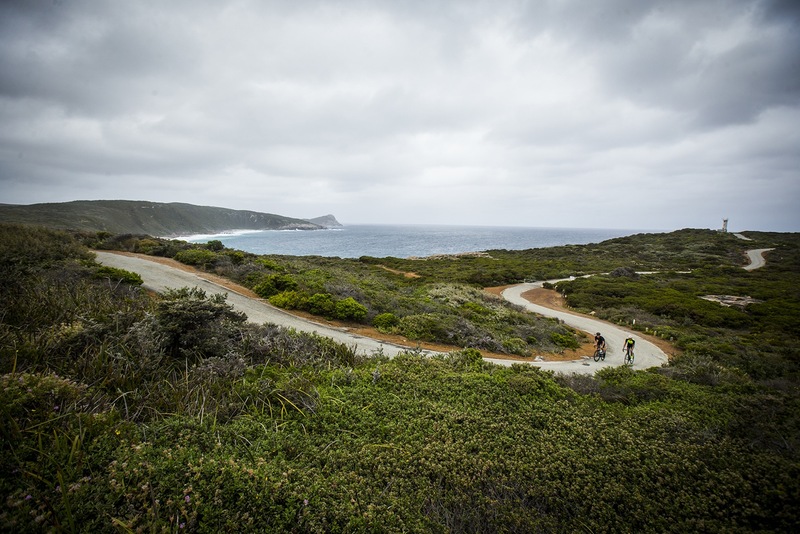 No wonder the local Noongar people called Albany Kinjarling – “the place of rain.” Amongst our bikes, Tim’s camera gear and a few too many jelly snakes we spread out the local 10 Great Rides guide to scope out some of the suggested routes. 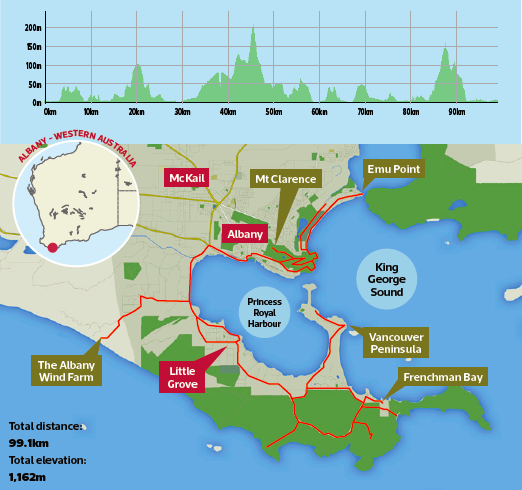 We agree on the Frenchman Bay ride, which runs along the southern edge of the sound and features a series of offshoots from the main branch of Frenchman Bay Road. Fast forward a few hours and the wind and rain have stopped. There are still some grey clouds hanging over the horizon, but the roads are dry and the air’s warming. It’s more typical of the Noongars’ Kambarang season – warm enough to ditch any jackets and warmers. Middleton Beach offers a different perspective to Albany centre; the water opens up to more of the sound and Mount Clarence hides the city behind. The flat land of the beach offers a few flat kilometres to warm our legs and spin out the long car trip. Heading south along Middleton Beach via Golf Links Road we pass the “Turtle Crossing”. 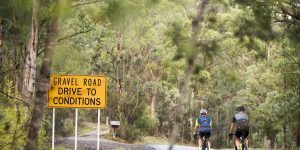 We all turns our heads in disbelief – we’ve ridden all over Australia, but this is the first time any of us have encountered a wildlife crossing and reduced speed zone for turtles! The sign serves its purpose; turtles or yabbin (or kilong) are an important energy source for the Noongar people, whose inhabitance in this region dates back over 45,000 years. We arrive at the base of Mount Clarence and after a quick look decide we’re going to need some breakfast. We find our first coffee shop, Bay Merchants Cafe, tucked behind the beach at the base of the hill. It’s run by Anthony McCormick, an avid cyclist and Perth man who came here looking for a sea change in his favourite holiday spot. The only problem, he says, is that he’s too busy with the cafe to get out on the morning rides. Many of the people we meet have a strong connection with this town. Family histories and memories run deep here. After an assortment of hot beverages, we accept the fact that we didn’t come all this way to just drink coffee. Anthony suggests we take the bike path skirting the harbour if our legs are too cold and stomachs too full for the climb. Just as we roll out, the local club pulls in for a post-ride coffee. It’s a massive group – it seems we were the only ones in town who were deterred by a little grey and drizzle. 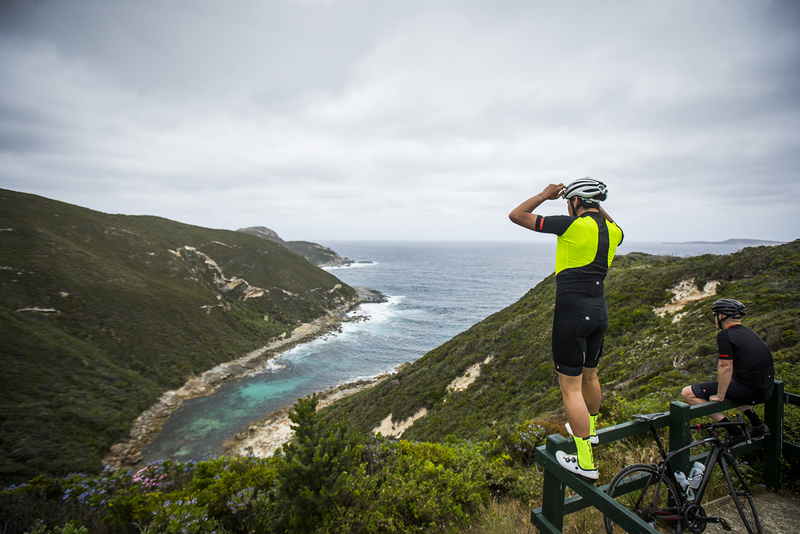 Though the bike path lacks elevation, the granite formations contrast sharply with the ocean, exaggerating the heights and giving us a full view of the harbour and sound. This was once the colony’s most important trade route to England and the state’s only deepwater port. We spot the historic ruins of a lighthouse on the red and grey slabs of the point and ponder how many ships it must have saved. The cliffs are scattered with ruins and old artillery bunkers, the waters dotted with immense boulders like marbles dropped in the sand. Turning the corner we look across the narrow mouth of the harbour to Vancouver Peninsula – a stone’s throw across the water by boat, but via bicycle we’re going to have to circumnavigate the entire bay. To the west we spot the wreck of the Cheynes II, an old whaler that wasn’t so lucky. We hop back on the bikes and ride into the historic centre, complete with another grounded ship (only in much better condition) called the Brig Amity. The heritage buildings date back to the first European settlement in Western Australia and originally as an outpost of the colony of New South Wales. Later I’m told the lighthouse and some of the old colonial buildings are haunted. They definitely feel eerie, but more in the sense of abandonment. We aren’t superstitious, but I’m sure if these walls and wrecks could talk they would. In a world of carbon and weight weenies the CAAD has remained legendary, an aluminium frame rivalling its carbon counterparts and still inspiring copies from major manufacturers today. 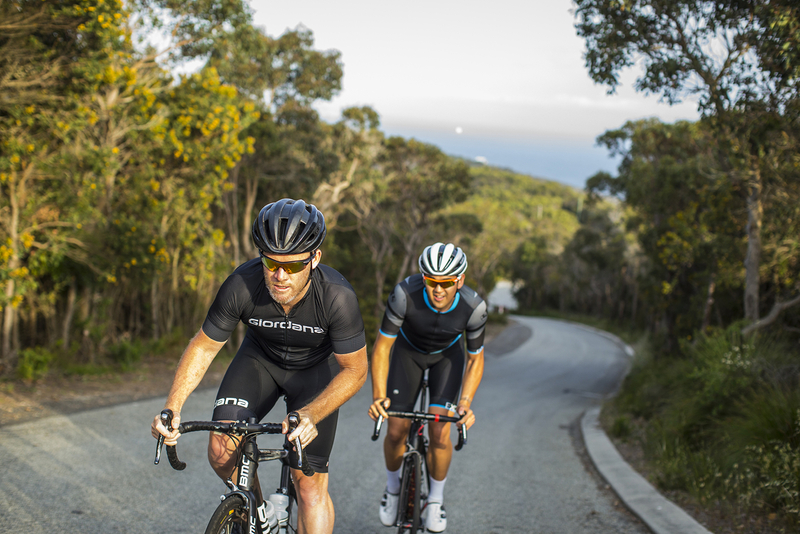 The CAAD (Cannondale Advanced Aluminium Design) series dates back to the CAAD3 with two Giro jerseys and plenty of stage wins made famous by Mario Cipollini and the formidable Saeco squadron. Fast forward nearly 20 years and it’s still a rider’s favourite. Tim’s Black Inc. edition is the top-of-the-line offering, and apart from components the main allure is the unmistakable exclusive paint-job. 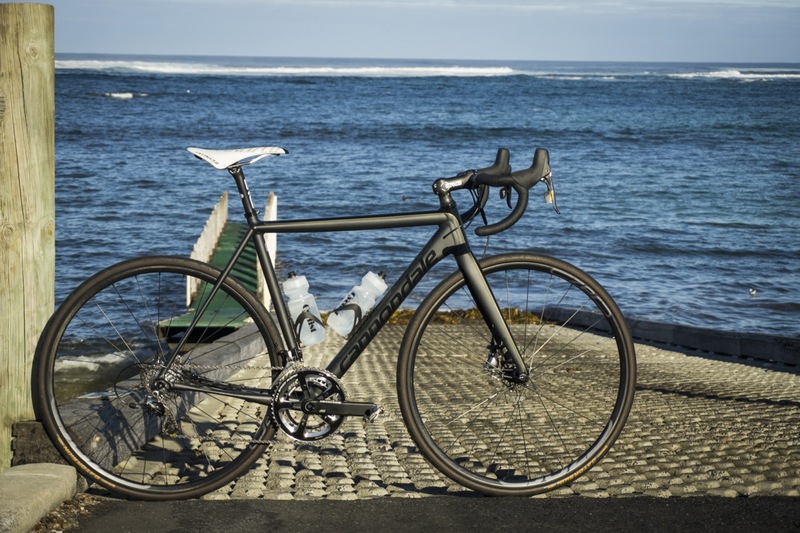 Keeping up with trends, Cannondale have added disc brakes. 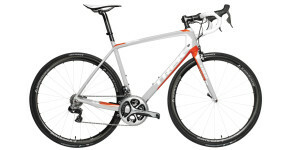 Like or loath them they’re inevitable, so at least Tim got the best, Sram Red Hydro, coupled with Sram Red components, including the extra-long derailleur cage to run some larger sprockets for those gravel pinches, and the super-stiff Cannondale Hollowgram SI crankset. 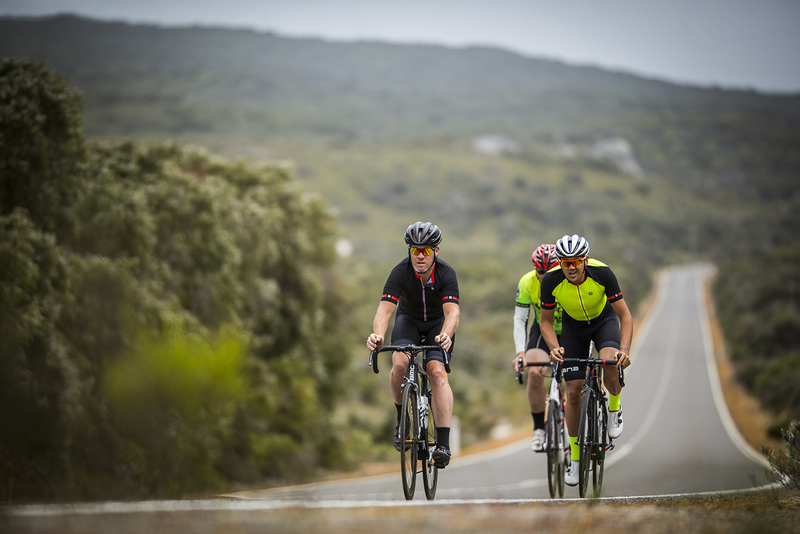 The complete setup may be slightly heavier than its carbon counterparts, but when hurtling along rock-strewn roads the weight is a small price to pay for the peace of mind and the guaranteed stopping power 28mm tyres and power discs offer. It’s not long before we’re out of town and have left the ghosts behind. We’re heading south from Princess Royal Harbour towards King George Sound. A detour beckons, a sign pointing to the Albany Wind Farm and Regional Prison (don’t get the two confused). The row of turbines looming on the horizon are finally getting closer. It’s grey, cold, windy and damp, and I begin reminiscing of Stage 2 of 2015 Tour de France in Utrecht. I know it’s not Europe, but it’s close enough, right? Andrew shakes his head. 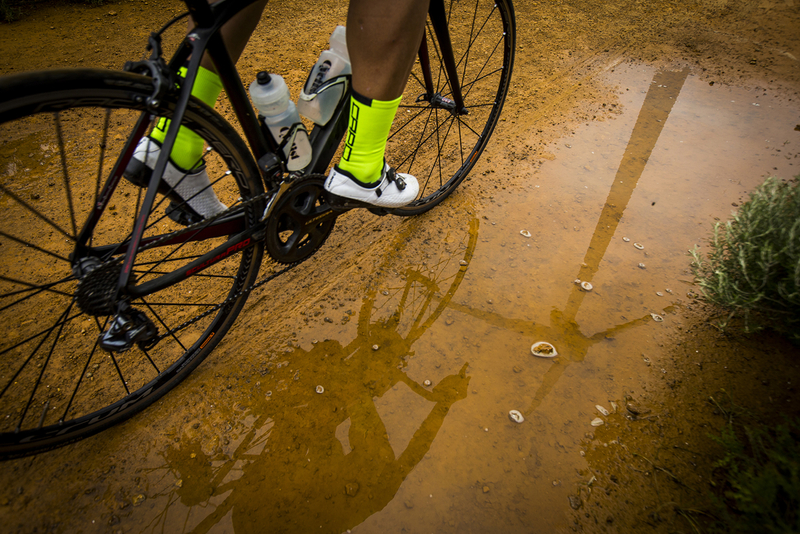 We look around; there’s only gravel and, not fancying a bush walk in cleats, we ride down the next dirt trail we can find. It leads right to the base of a turbine – it never takes long to be rewarded when venturing off the bitumen path. The turbines are enormous, with what seems like only a light breeze keeping the blades spinning, the force of the wind evident in the ‘whoosh’ as a tip flies by and the motor rumbles and groans. But right now we need more pedal power, not wind power. We follow Carl down past a lighthouse to a lookout called The Gap and a rock formation known as the The Natural Bridge. The ferocity of the Southern Ocean is arresting. The water heaves, and the shoreline is blurred with mist and ocean spray as far as the eye can see. Cliffs and slabs have been cut sheer, a smoother and lighter shade of grey, a result of the constant weathering. The climb out of the ocean continues up to Stony Hill, a granite cairn rising above the trees. At this point, Carl conveniently has to “head back to the office.” We watch his solitary figure roll down the long road with the turbines and town in the distance, like a single ant marching down a line. 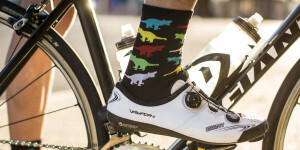 Without even a grimace, Andrew stands up and pushes the pedals down and through with ease. 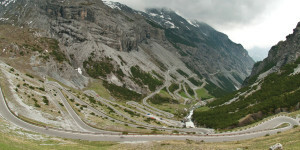 I quickly start flicking through gears, hearing the twang and strain of the chain as the grade steepens. I sit up, drifting back, watching Andrew and the incline increase ahead, when I catch the flare of light off a lens. Tim always chooses the steepest ramps to be sure he captures our pain faces. 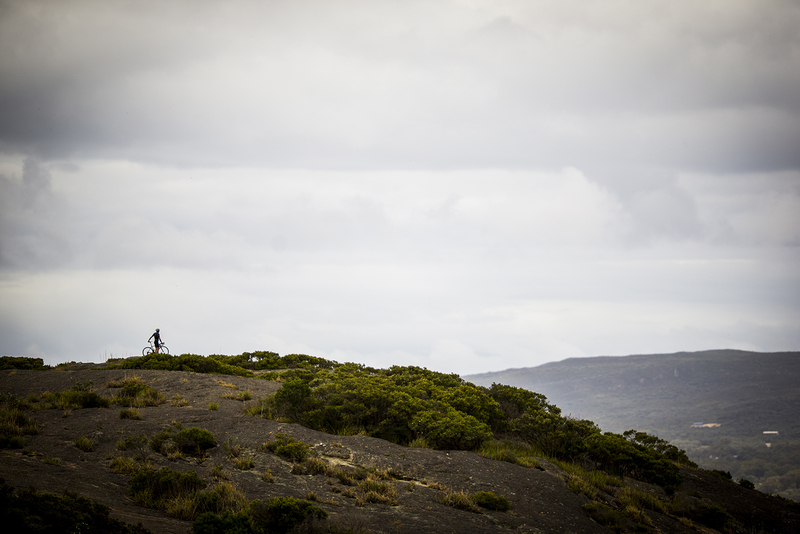 From the highest point on the ride we can see over the dense, windswept scrub. We make out the road carving a path through the thickets of banksia, their tops all level, pruned and shaped by the southerlies. We turn our backs from the summit and grip firmly on the bars, enjoying the tight corners with the gradient in our favour. Discovery Bay is in sight and we keep rolling, trying to hold speed all the way to the ocean, craning our necks over our shoulders and shrubs in anticipation of a glimpse of a whale at any moment on the horizon. Our watch is interrupted by an encounter with Coolbardie – the magpie. In Noongar Dreaming, magpies were responsible for propping up the sky. With sticks in their beaks they pushed the sky and clouds higher and revealed the sun and the first sunrise. Their boastful dawn chorus celebrates the sunrise every day. It makes me wonder if it isn’t defence that has made him so aggressive; perhaps he’s just agitated the sun hasn’t come out much today. We reach the furthest point on our ride and the resting place of the Cheynes IV whale chaser. I can’t imagine the idyllic and raw beauty of the ocean’s turquoise water and white sand bustling with commercial whaling, but both the Indigenous and European histories in the area are closely linked to the practice. The Noongar regarded whales as totems, made specific utensils for whale meat (taap), and still retell stories of Mamang, a large whale, and a local man who dives into its belly. The wrecks of the Cheynes whalers, meanwhile, tell a very different tale. It’s interesting to think that what was once the largest whaling port in the Southern Hemisphere has now become one of the leading wind energy producers in the country less than 25 years after the last whale was butchered. Some 80km later and we’re back in Albany. Mount Clarence appears ahead and it’s deja vu as Andrew suggests another coffee. Why not? It’s not a daunting climb, but the cafes are always tempting. Plus, the sun has returned and is baking the historic sidewalks of Stirling Terrace. We sit, chat and bask, then share a nod. Helmets are back on and up we go. At the turn-off we go right for Mount Adelaide, home to the National Anzac Centre perched on the hillside and almost falling into the waters where the convoy was docked. It’s a tranquil location to commemorate the 41,000 Anzacs that left these shores. We promise to return a little more appropriately dressed to pay our respects. It’s nearing sunset (we often get carried away during these riding and shooting days), so we turn and roll along the saddleback to Mount Clarence through the tree-lined Avenue of Honour. As we crest the climb we’re greeted with the huge bronze horse of the Desert Corps Memorial backlit by the golden rays of the sun. The memorial was brought to Albany after its partial destruction in the Suez crisis in Egypt. Look closely and you can still see the bullet holes in the foundations. We then catch our breath at Padre White Lookout – named for Arthur Ernest White, who served as an army chaplain. The lookout marks the spot where he led the congregation from St John’s Church along a dirt track to the top of Mount Clarence and observed a wreath being laid in the sound below. This was Australia’s first recorded Dawn Service. 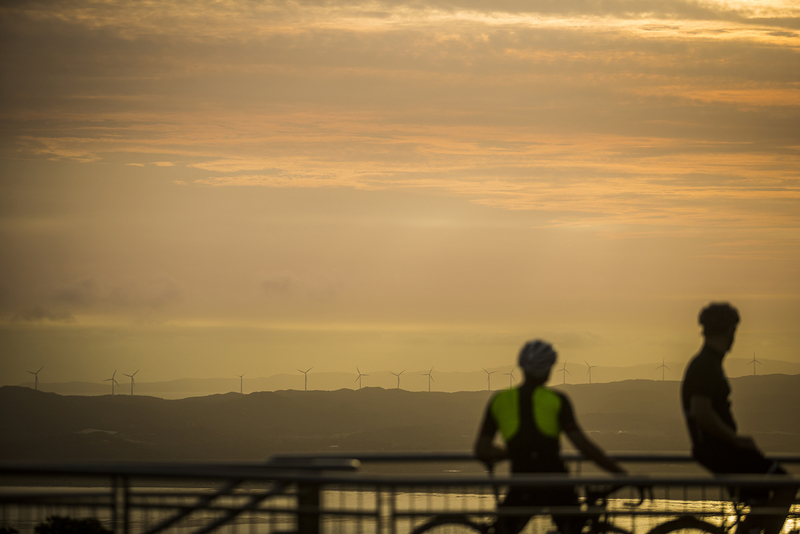 Gazing out over King George Sound – Discovery Bay to the south, Middleton Beach east, the wind farm backlit with the setting sun in the west – we can almost spot our hotel. Home in sight, we bomb down the fast and wide descent to the beach. It’s a flat spin back. We’re nearly home with 98km covered. Should we go for the century? “Why not?” replies Andrew, and we take a little detour to Emu Point. Wanting to avoid any tetrapod traffic, we opt for the bike path, but we didn’t expect to be dodging doves, horses and blue-tongues. Thankfully, this time there were no magpies. Nearing dusk, it’s a safe bet Coolbardie and Padre White will both be resting till the dawn. Nestled amongst the hills, harbour and sound, Albany is very easy to navigate – just follow the water. From the seclusion of Bayside, travel south down Golf Links Road and past the Turtle Crossing to Middleton Beach, taking a left into Adelaide Crescent and Bay Merchants Cafe. 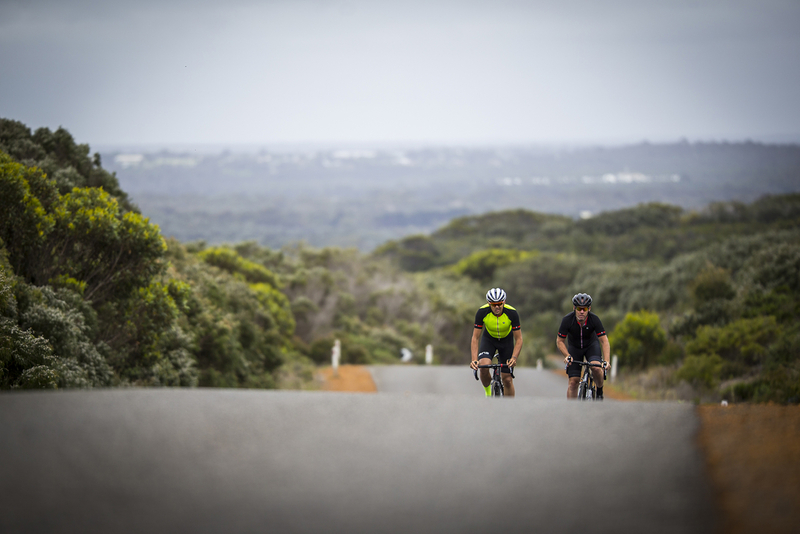 Then take either the high road, Marine Drive, or the low road and bike track, Ellen Cove Boardwalk, to the historic Stirling Terraces and Albany town centre. Cross the tracks and prepare to stop for trains – don’t try any Paris-Roubaix stunts here – and then continue along the shoreline on Princess Royal Drive, past the Brig Amity to Frenchman Bay Road. Frenchman Bay Road offers plenty of possibilities. 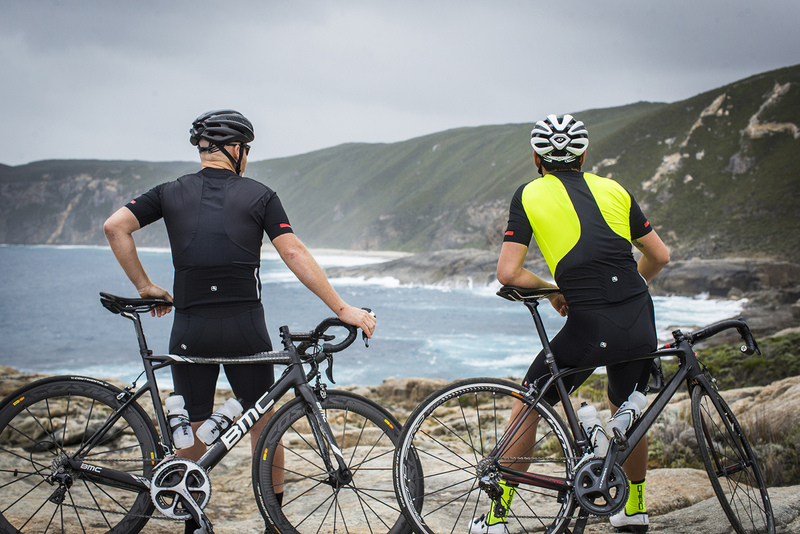 Recommended detours include an out and back to the wind farm with a sharp short climb; an alternative route via Bay View Drive to follow the water before climbing the ridge into Torndirrup National Park; and a roll down to the Southern Ocean and Gap lookout followed by a climb to the highest point on the ride, Stony Hill. Enjoy the descent back to the sound via the beautiful ocean beach of Salmon Holes (watch out for the magpies!) 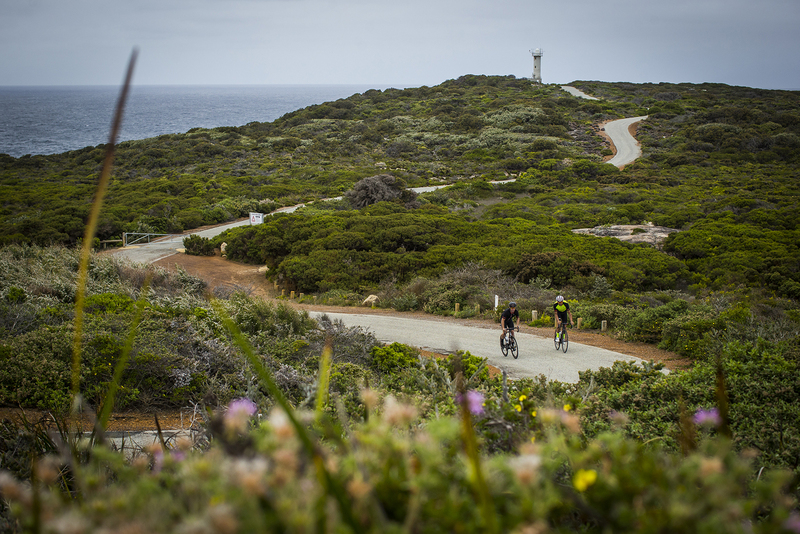 and the whaling station at Discovery Bay, returning back through Goodes Beach with one last detour through Vancouver Peninsula along Quaranup Road (a gravel bike could be a bonus here). Then it’s back to Albany, with a coffee stop at Stirling Terrace then up Mount Clarence and Adelaide via Marine Drive. To reach the elusive century, try the secluded beachside bike path, Ellen Cove Boardwalk, all the way to Emu Point and back. 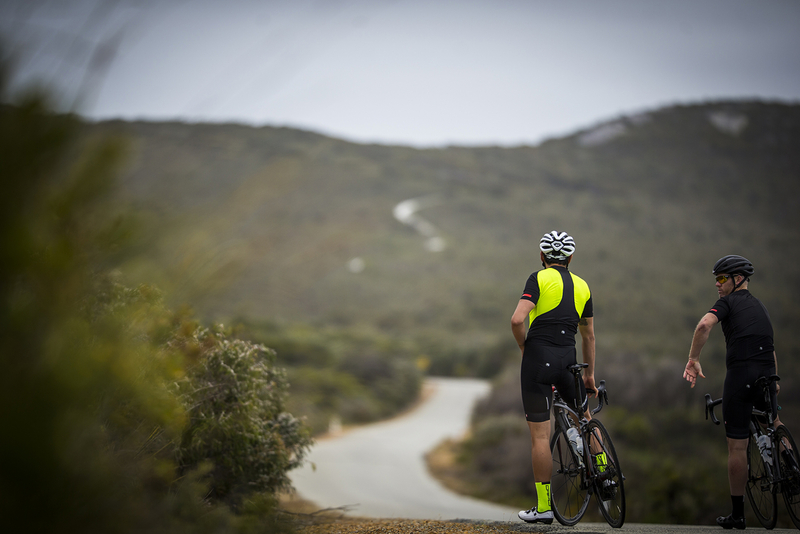 It’s flat and perfect for spinning out a hard’s day pedalling. We flew Virgin Australia return from Sydney to Perth – don’t forget the three-hour time difference! The trip back is one hour less thanks to the jetstream at our backs. Our bikes in bags with kits were still under the 23kg included baggage, but it could be wise to order extra. There are connecting flights from Perth to Albany, but to really see the region we hired a van, perfect for all our bikes and gear, from Budget. 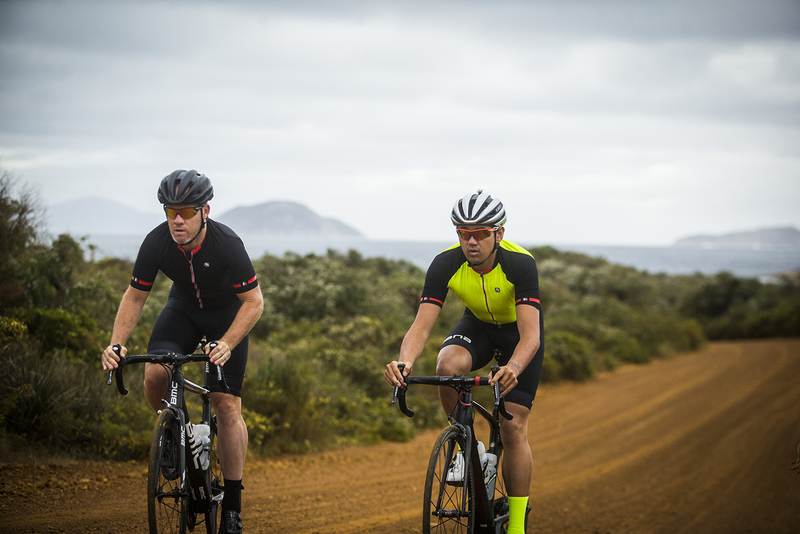 We recommend driving down via Margaret River or Busselton and the South Coast Highway for the scenery and options to break up the 6-7hr drive, but quickest is direct via Albany Highway in 4-5hrs. Ocean Mist Villa – secluded between Middleton Beach and Emu Point – offers a three-bedroom home with kitchen, dining, laundry facilities and plenty of room to park the bikes – and don’t forget the spa to rest those tired legs. The Beach House at Bayside, just across the road from Ocean Mist Villa, is for those seeking a more luxurious hotel experience. 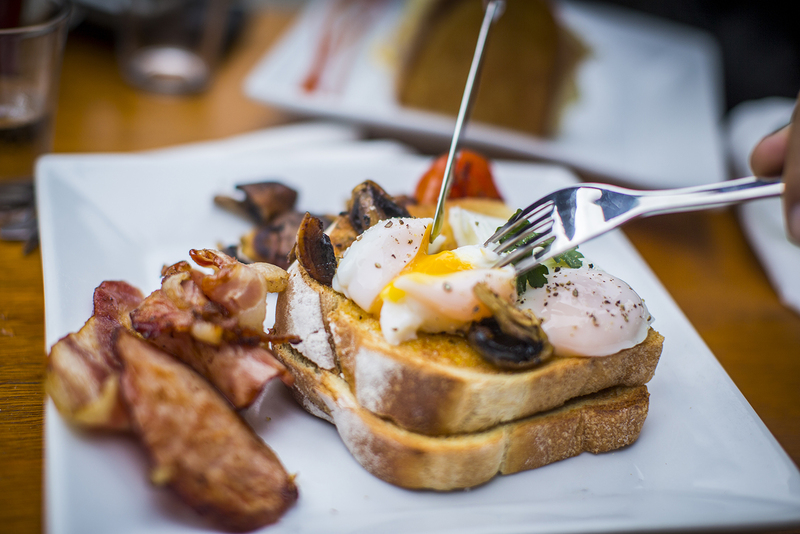 You won’t need the kitchen facilities once you see their incredible breakfast buffet. 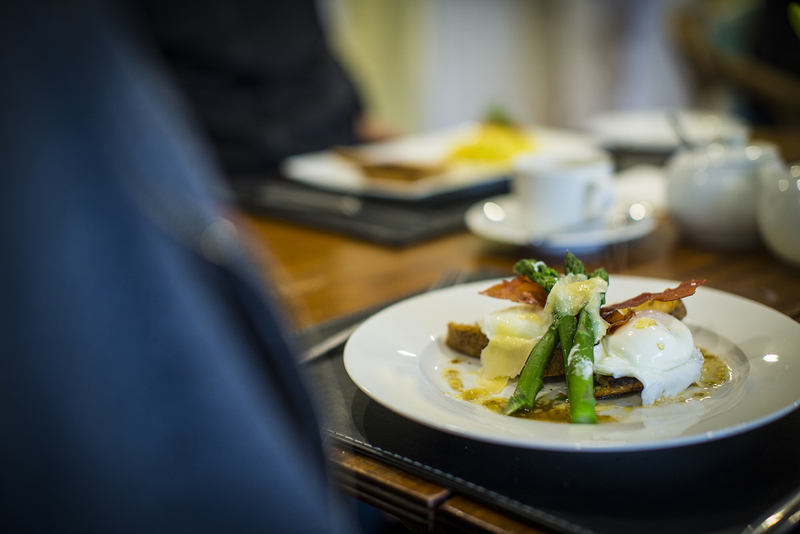 Bay Merchants – Middleton Beach and the bunch ride’s local, it offers excellent coffee and food with plenty of local produce. 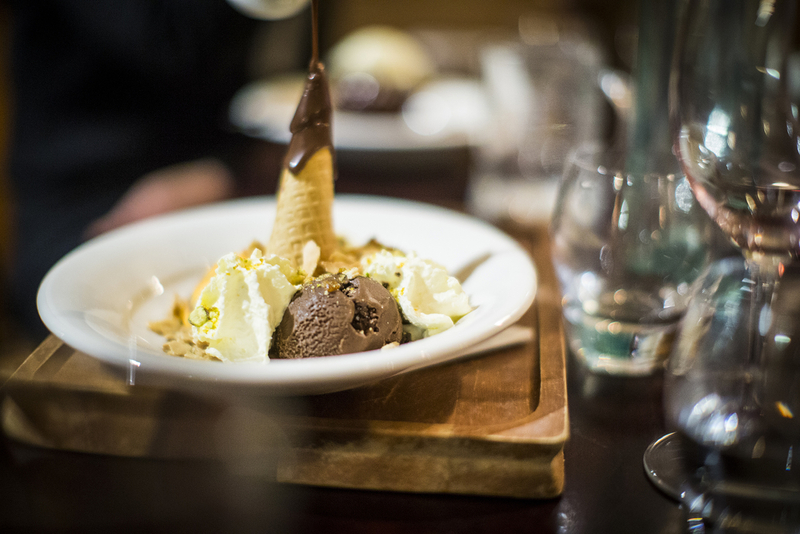 Kate’s Place – A historic shopfront on Stirling Terrace right in town overlooking the harbour with an interesting menu – especially the desserts. Emu Point Cafe – A perfect little spot on the mouth of Oyster Harbour for fish and chips and a milkshake. Hybla – Opposite the beach, showcasing more than just sun and sand with plenty of local craft beers, wines and meat, it even has bike racks out the front and a piano man inside. 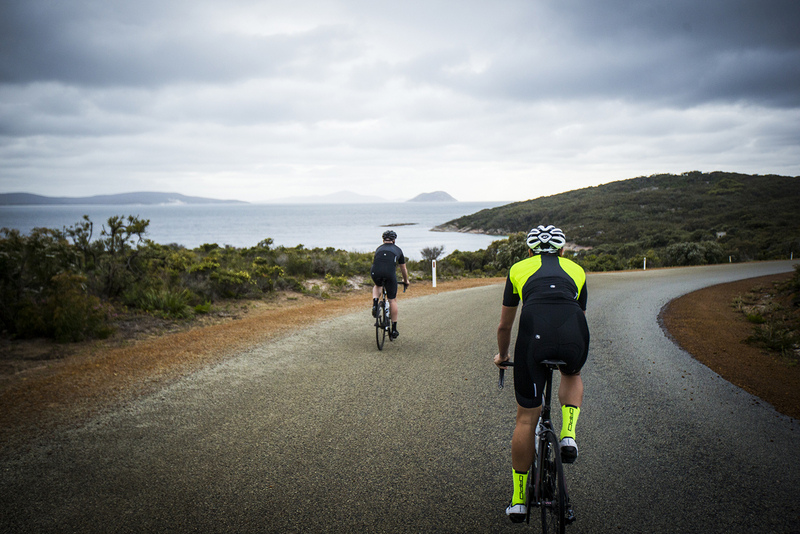 Australia’s South West tourism for arranging an incredible trip introducing us to Albany, and the Albany City Council for some forward-thinking, showcasing their surrounds with the pocket-friendly 10 Great Rides guide and their excellent network of bike paths. 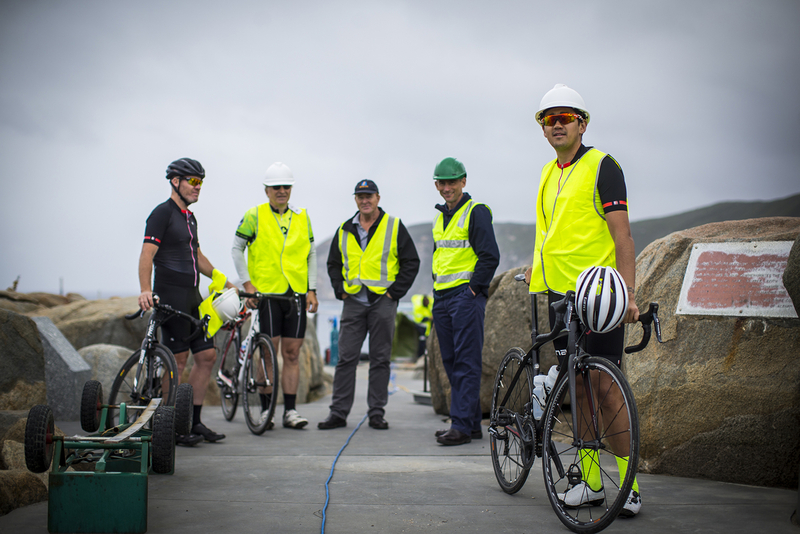 Stay tuned for more of their cycling initiatives and events. Thanks also to Albany Cycle Club – including Carl Beck and Stuart Passmore – a highly involved club with incredible participation numbers and advocacy. Thanks to Giordana for keeping us comfortable on the bike and finally to Mount Romance Sandlewood for their post-ride skin-care, highly recommended when riding exposed to Albany’s elements.